Facelift's access expertise was called upon in a significant restoration job of national importance yet again last month, when we were asked to assist with a survey being carried out on Temperate House in Kew Gardens. The largest surviving Victorian glasshouse in the world, Temperate House is being restored in a five-year, £34.3 million restoration project. The glasshouse itself and its surrounding landscape will be restored, while the adjoining Evolution House will be converted into a world class public engagement centre. 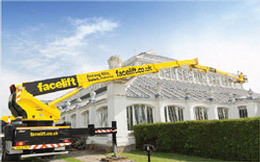 Kew Gardens - who regularly use Facelift because of its competitive pricing and the range of specialist equipment available - also hired a Facelift operator whose expertise ensured that the fragile glasshouse was not damaged during the survey, and that the machines hired were used to their full capability. For the exterior survey, a Bronto 50 was chosen, as its incredible 50m height meant Kew Gardens staff could get a complete ariel view of the site. Its large basket meant that several team members with different specialisms could view the greenhouse simultaneously, in order to complete the most detailed survey possible. For the survey of the interior of the glasshouse, a Multitel SMX 225 was used. Its light weight, impressive reach and height, and easy manoeuvrability meant that it could easily access the confined spaces of the glasshouse, and negotiate its way round the many large trees within.